A week ago today, I headed up to New York City for the annual Time to Play Holiday Showcase. The event is a toy fan mecca – one expo room full of every hot holiday toy pick for the season. Just walking into the room was overwhelming in a wonderful way – for a product reviewer, it was the place to be! I’ll be bringing you all some reviews and photos of the toys I got a chance to see and play with while I was there. Some really great stuff for your kids this holiday that I am really excited to share. Today I bring you Fairy Tale High. You gotta love this concept, right? 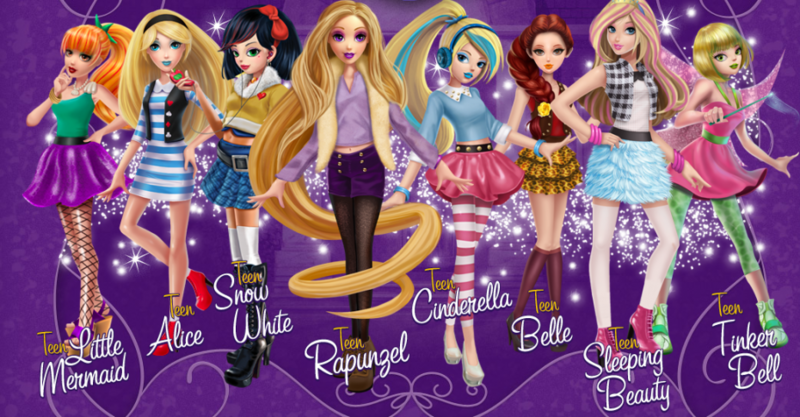 These are all of the princesses and fairy tale heroes your girls have grown to know and love – but the dolls are the princesses when they were in high school! Can you guess and spot who everyone is in this photo? There’s Rapunzel, Alice in Wonderland, Tinkerbell, Sleeping Beauty & more all in this pict!